​My portfolio featuring mods for NASCAR Racing 2003 Season by Papyrus. One of the most successful racing game franchises is the NASCAR Racing series from Sierra/Papyrus. It began in 1994 with the very first "NASCAR Racing" for PC. A handful of future NASCAR Racing titles would come along through the history of the franchise. Of them all, the most successful is "NASCAR Racing 2003 Season." Even the popular online racing sim iRacing utilizes NR2003. Though this is a NASCAR game, people have designed their own mods for it ranging from cars to tracks. NR2003 still has a strong following despite being an old game. The vastly popular "NASCAR Racing 2003 Season" PC game is among one of the greatest racing games of all time. Even today, this game is still played among a number of gamers and racing fans. I created a few liveries for cars for this game. ​EXTRA NOTE: I don't drink or smoke; and so with the liveries I present, I choose not to feature liveries of alcoholic beverages or tobacco. This car I created was with the NASCAR Gen-6 stock car body for NR2003. It is a team car simply to identify me and my team. 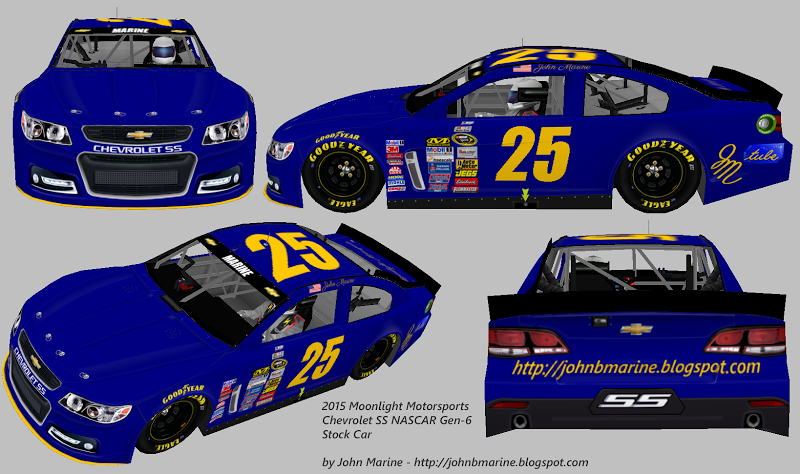 The fictional race team of mine is called "Moonlight Motorsports," and this is my Moonlight Motorsports Chevrolet SS. This car is based on the NASCAR Gen-6 stock car mod for NR2003. 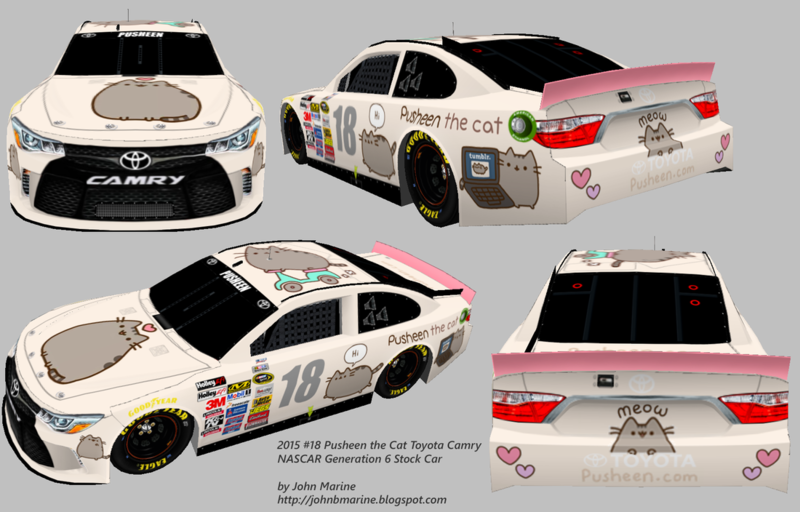 It is a Toyota Camry adorned with graphics from the webcomic character Pusheen the Cat. You could call it the "Pusheen the Cat Toyota Cat-mry." NOTE: Pusheen is NOT my own creation. To learn more about Pusheen the Cat, visit: http://www.pusheen.com. I will have more material to share in future edits. So make sure to Bookmark this site or something to keep up with the latest material.